I love fajitas. Growing up, my family made grilled chicken fajitas for dinner usually once every week and we actually still do. Even after having homemade fajitas many, many times, fajitas is usually still one of my answers if my mom asks what I’d like for dinner when I come home from school. I always crave my favorite family meals when I’m at school, including homemade fajitas. When I’m cooking for only myself, I also make a lot of vegetarian meals. That’s partially because they’re easy & inexpensive, and partially because I like the idea of reducing the amount of meat in my diet. I really like the Meatless Monday movement! 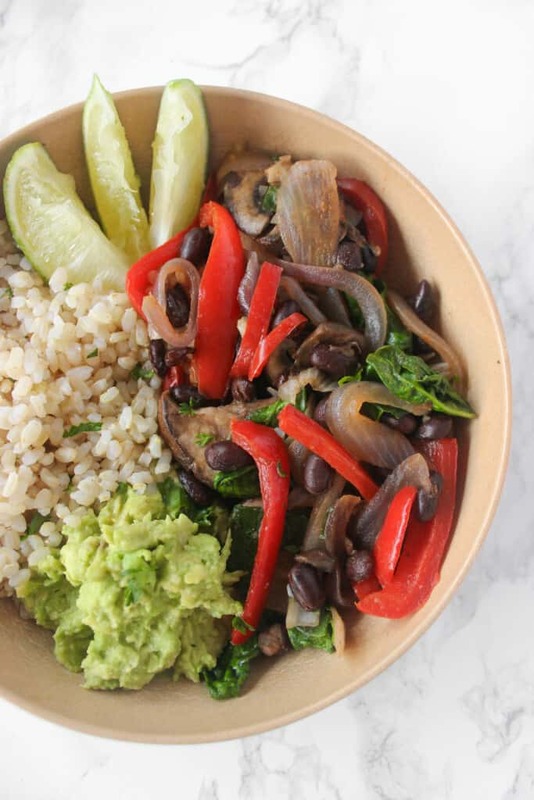 So, to satisfy my fajita cravings and make an easy vegetarian meal, I’ve started making vegetarian fajita bowls with all of my favorite aspects of regular fajitas– the sautéed peppers and onions, the guacamole, and just a little bit of spiciness. 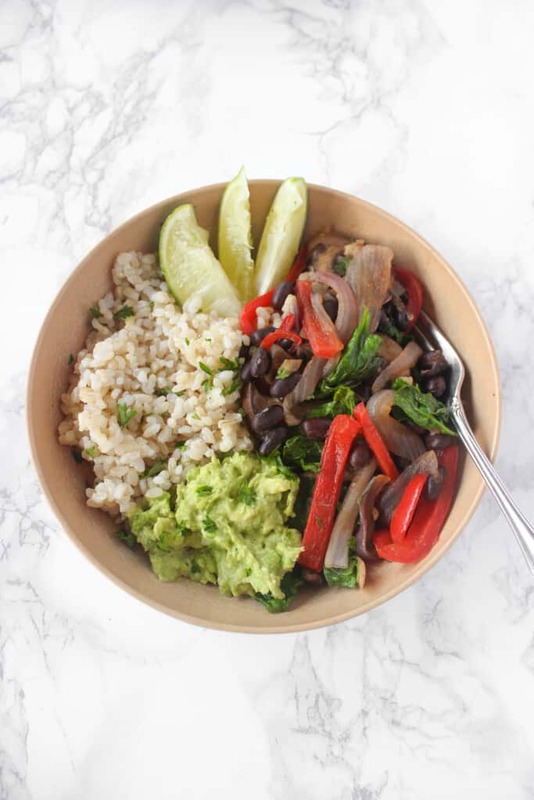 I keep my vegetarian fajita bowls simple with just a spicy black bean & veggie mixture, brown rice, and simple guacamole (just mashed avocado, garlic powder, and a squeeze of lime juice). To make these easy bowls, start by cooking the brown rice. I start it first because it cooks for 35 to 40 minutes from start to finish. 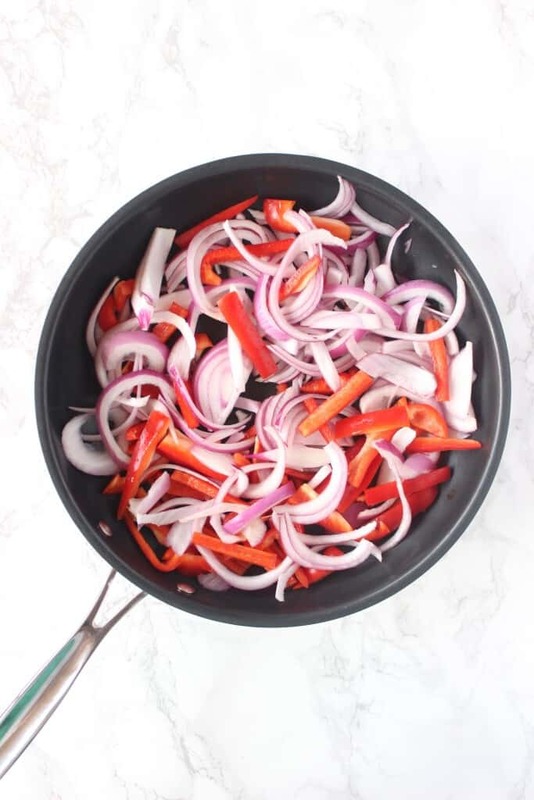 After starting the rice, sauté the fajita veggies (red onion, red bell pepper, and minced garlic) in a little bit of grapeseed oil over medium low heat. Any type of bell pepper or onion would work well! After a few minutes, add sliced mushrooms and cook everything until the peppers and onions start to soften. And then add the drained and rinsed black beans. 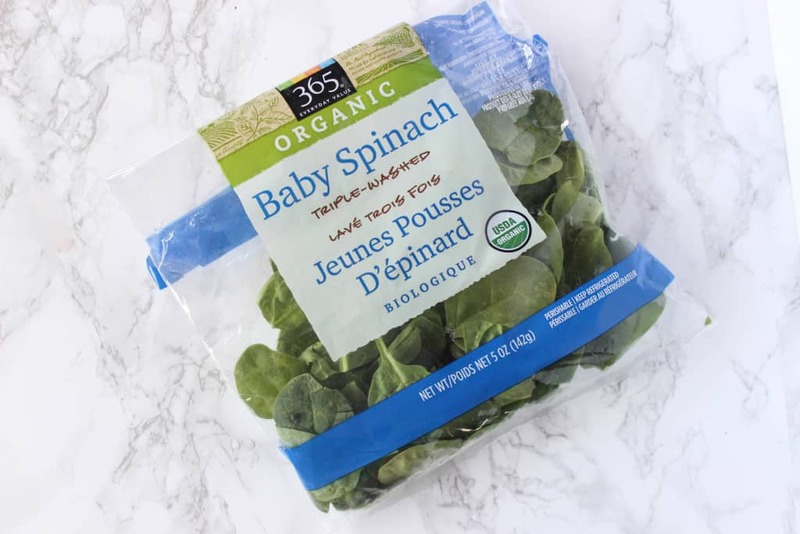 Then, add a few cups of spinach on top and cover the skillet with a lid to help it wilt faster. About half of a bag! 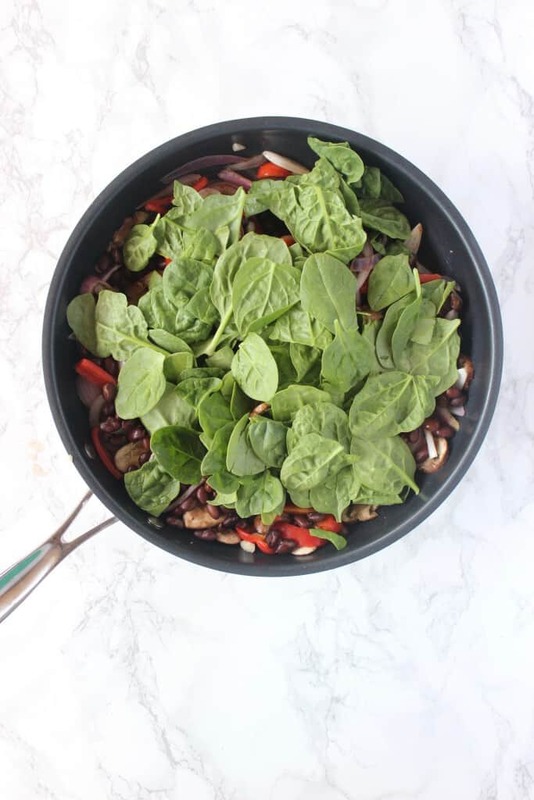 Once the spinach wilts, serve the black bean & veggie mixture alongside the brown rice. 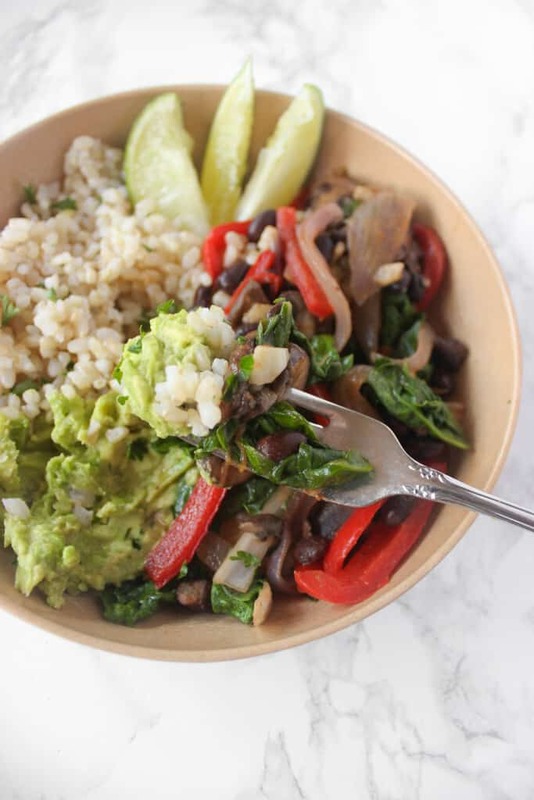 Then, add all of your favorite toppings like guacamole, cheese, sour cream, salsa, and pico de gallo to your vegetarian fajita bowls. If you try out the recipe, feel free to let me know in a comment or take a picture and tag me @livbane on Instagram. Hope you enjoy! Toppings: guacamole, sour cream, cheese, salsa, pico de gallo, etc. Start by cooking 1 cup brown rice according to package directions. While it cooks, prepare the black bean & veggie mixture. Once rice is done cooking, add lime juice and fresh cilantro and stir. 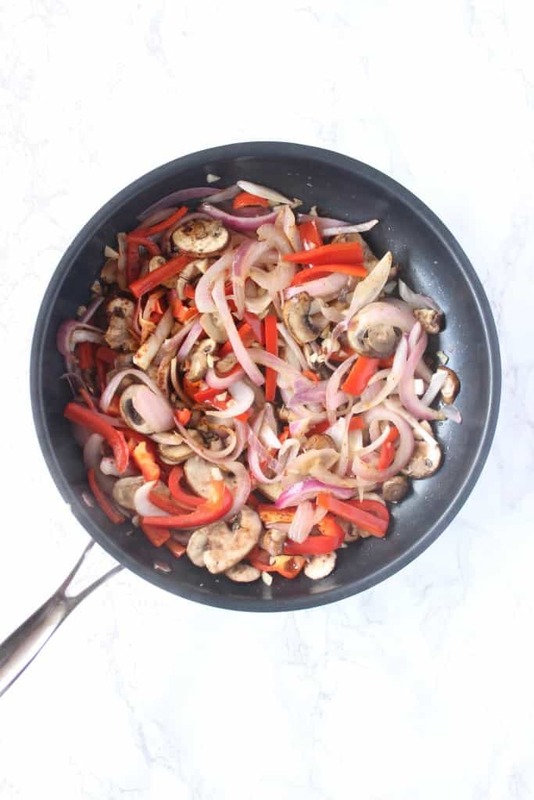 In a large skillet over medium heat, sauté bell pepper, onion, and garlic in cooking oil. After 3-4 minutes, add mushrooms, chipotle powder/chili powder, and pepper, and cook until veggies are softened. Add black beans and stir, then add fresh spinach. Cover skillet with lid to help the spinach wilt. 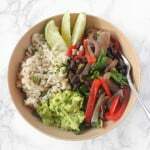 To serve, layer brown rice, black bean and veggie mixture, and toppings like guacamole, sour cream, cheese, salsa, and pico de gallo in each individual bowl. For guacamole, use a fork to mash avocado and add garlic powder and lime juice to taste. Hard to believe you can do all this in a dorm. The dorm kitchens aren’t the most convenient, but there’s a stove and that’s all I needed! Such a yummy, easy recipe! I love fajitas in tortillas, but anything in a bowl is my jam. And so much easier for on the go! My mom also used to make fajitas growing up that were so good. Thanks, Megan! Our moms and their fajitas! These are like the staples of my life! Love how affordable it is too – as a college student it’s so nice to be able to make delicious meals that aren’t crazy expensive! Agreed! Paying for my own groceries over the past couple of years has been, shall I say, enlightening? Food can be surprisingly expensive! 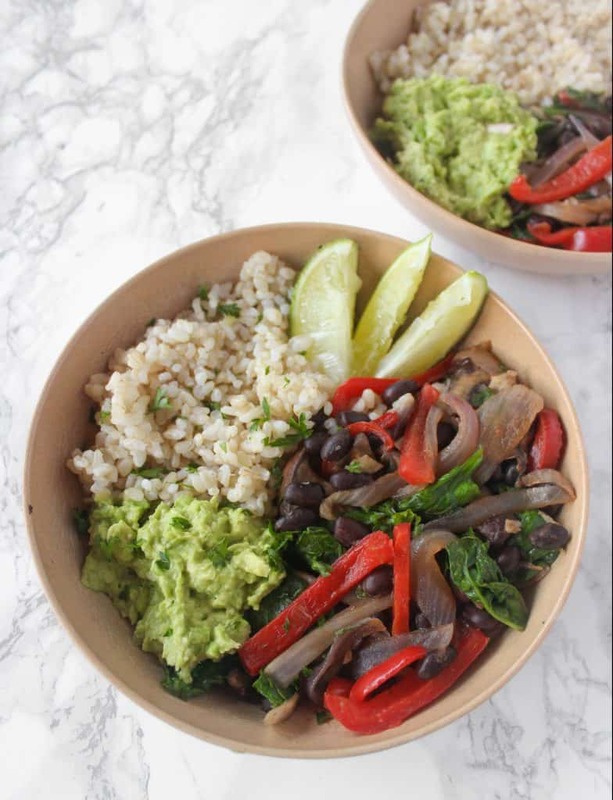 Fajita and burrito bowls are some of our favourite go-to quick and easy meal options – especially when served with guac! This bowl is the perfect combination of flavours! Guac makes all Mexican food better! question- how do you take photos in your dorm? Great question! My desk is in front of my dorm room window, so I place whatever backdrop I’m using on top of my desk and use the natural light coming in from the window. Thanks for your kinds comments always, Edye! Yum! I love bowls like these. 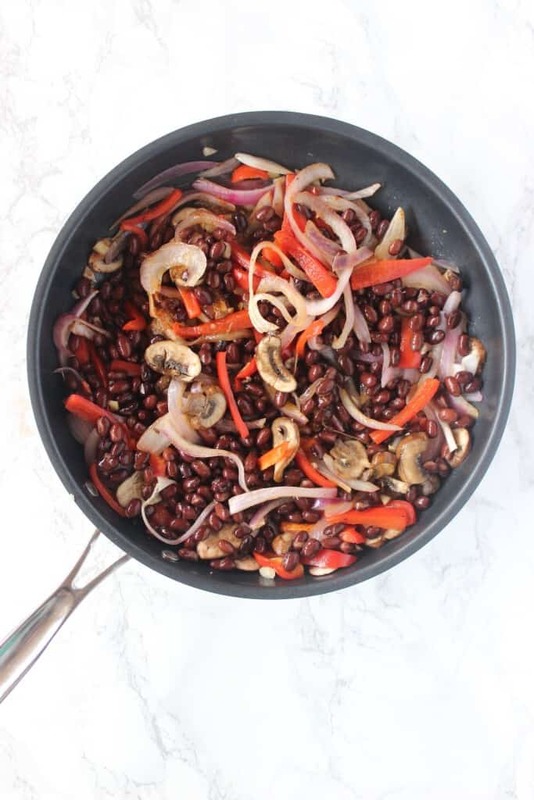 I usually do lots of beans and corn, but I love the addition of mushrooms for fajita style. I love the beans from whole foods- they are so affordable too! ill have to try the spicy kind! I have been making something like this lately for a quick dinner. I take whatever fresh veggies I have and add some rice or if I don’t want to make rice I microwave a rice packet that has kale and quinoa in it or microwave some riced cauliflower. Veggies & rice are an awesome combo!